I wish I could say that all of my movie watching was a noble attempt to chronicle the history of film. Then, sometimes, the Sunday Night Football game gets out later than you want, but you feel like a movie. And then you go to Amazon Prime and then find the first short movie you think might not be terrible. 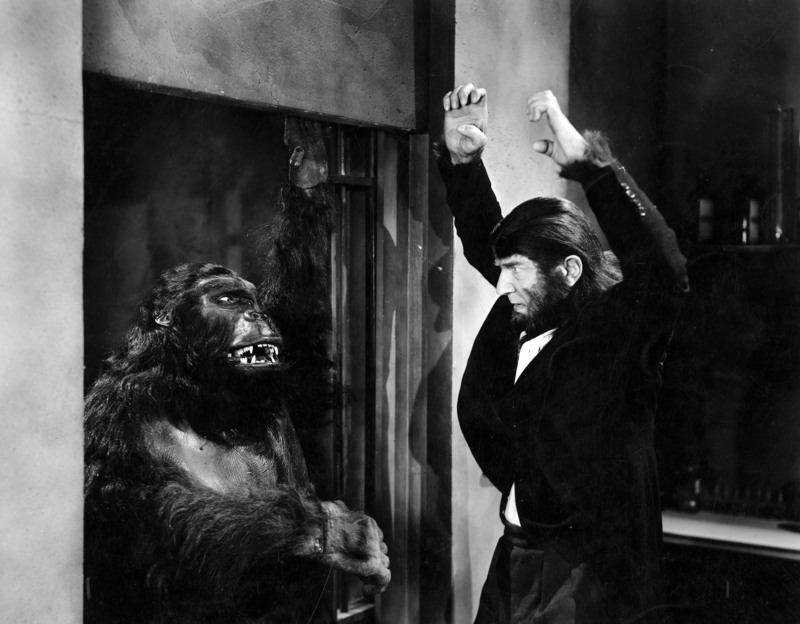 And then, in those circumstances, you end up watching Bela Lugosi in THE APE MAN. Oh, and in the inane information department, this is my 739th ranking, but my first from 1943. I watched THE APE MAN (1943) on 9.29.14. It was my first viewing of the film. So not every print is created equal. The Amazon Prime print of THE APE MAN, for example, has more background noise than is comfortable with a barely in focus image. A movie viewed this way has a handicap. If you were to watch 2001 A SPACE ODYSSEY on VHS, for example, you might be underwhelmed. A movie with this poor quality of print might possess you to turn on subtitles so you can understand what is going on. Only it would seem that someone watched this one time and wrote the subtitles as they went. Anything they couldn’t figure out gets an (inaudible) even when the dialogue is very audible. But I digress before I start. 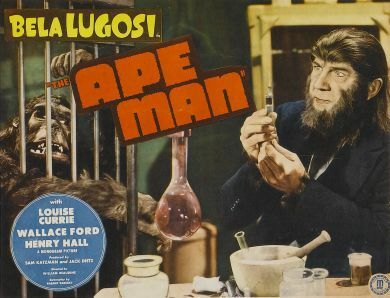 This is a film about a guy who has done enough scientific damage to turn himself into the titular APE MAN (Bela Lugosi). In this form, he looks sort of like an unshaven Abraham Lincoln, sans top hat. He doesn’t look much like an ape. And we wouldn’t think him one unless his first scene found him in a cage with an ape and showed us his sister screaming when she sees his face. Sure, he sometimes walks with a bowed back, but this isn’t particularly scary. He might just have sciatica. He talks normally, so there isn’t much damage done. He really just needs a razor. But everyone in this film is treating it like this is some big deal so we, as an audience, are asked to do so as well. Perhaps this had some impact in the early 40s, but it is an example of the type of film that modern Michael Bay fans might picture when they think of black and white flicks. This is an unscary and uninteresting movie in which nothing of note really even happens. A girl named Billie Mason (Louise Currie) is introduced in an effort to give us a leading lady. She talks smart and has a man’s name, so we know she must mean business. Only, the problem is, we aren’t given much reason to care about her or anyone else. This might be helped by better acting, but this feels like true B-movie one-take time filler. Bela Lugosi had, at this point in his career, played major classic roles like Dracula and The Wolf Man. But this is either a case of a legend mailing it in, or a case of an actor not being able to discern quality material. In fairness, this was probably a contracted role which he did like a plumber would unclog a toilet. Both examples would involve plenty of crap. A little research shows that this was shot in 19 days. It feels like they wasted 18 of them. The idea here, in case you make it this far, is that The Ape Man needs a serum in order to become a man again (because razors apparently cost too much). But that serum needs a human sacrifice. This set up leads to the events of the film, if any were to be be mined. Watching this movie leaves one waiting for something of note to happen. Is this a horror movie? Is it a character study which lacks any characters worth caring about? When The Ape Man starts throwing things at some ape (or some guy in an ape suit), the music picks up. Does that mean something is about to happen? They go to another doctor’s home. An invasion? Maybe. A knock at the door… Nope. Just some assistant. But Lugosi really wants something, so we must have some event waiting in the wings… Lugosi even grunts at the other gorilla to signal that it is time to do something. Then the ape merely kills the assistant with a sleeper hold that Rowdy Roddy Piper might have called pedestrian. The other doctor comes in and ‘acts surprised’ before calling the police. That scene pretty much sums up this film. Trumped only, perhaps, by The Ape Man’s sister pulling a gun on what amounts to a good guy as she acts tough. By the time this movie finally lets loose on the action, it is far too late. Even if it weren’t, seeing a man on the street being attacked by some dude in a monkey suit is less than scary. There is exactly one good shot in this film, though, and that comes as a soon to be victim sees the silhouette of a gorilla about to attack. If only the rest of the movie had such care for atmosphere. And, lest you think the climax escalates things, the ending is silly and less than interesting (until the reporter says to traumatized, female Billie “I want you over my knee and paddle you good.” and then some dude in a car says “I’m the author of this story. Scary idea, wasn’t it?” And then the movie ends. No. Not scary. Stupid. Whoops. This paragraph needed a Spoiler Alert. My bad. I am usually the guy who trumpets how much you should see old films. But sometimes a terrible movie is just a terrible movie. There were so many wonderful films made in the early 40s, even as Hollywood was being stifled by censorship. But, honestly, THE APE MAN does not qualify. It is a truly bad movie. ~ by johnlink00 on September 29, 2014. Haha thanks. This is a crappy movie.